AOS Assistant Professor Danielle Bianchi is among 126 scientists and scholars from 53 colleges and universities in the United States and Canada selected to receive a 2018 Sloan Research Fellowship. The Alfred P. Sloan Foundation selects early-career scientists and scholars who are rising stars. 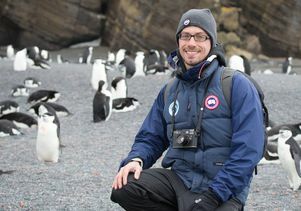 Professor Bianchi studies how physics, chemistry and biology come together to regulate ocean ecosystems, and seeks to learn in what direction they may change in the future. "The oceans are the Earth’s last wilderness," Bianchi said. Scientists have a deep appreciation of the oceans’ role on climate and the carbon cycle, and as enormous reservoirs of biodiversity, but the oceans are changing in ways we do not fully understand; these changes include warming, acidification, deoxygenation and overfishing. Bianchi’s research team is especially interested in the cycles of oxygen and nitrogen, the ecology of the deep ocean zone and the role of animals — from zooplankton to fish — in the marine ecosystem. His research tools range from global observations to theoretical and numerical models of ocean biogeochemistry and ecology. Bianchi and colleagues published a study in 2017 in the journal Nature Communications confirming that climate change poses a major threat for global fishery, and showing that technological progress in fishing technology could pose an even greater threat.